In the years just after the Civil War, America was led by Andrew Johnson. The Democrat rose from vice president to president when Abraham Lincoln was assassinated in April of eighteen sixty-five. Andrew Johnson soon found himself in a bitter struggle with Congress. In eighteen sixty-eight, radical members of the Republican Party held a trial in the Senate. They tried to remove the president from office. But they could not prove their charges, and their effort failed by one vote. When the trial was over, Johnson had less than a year left in office. He retired to his home in Tennessee. By then Americans had elected a new president. This week in our series, Larry West and Shep O'Neal tell the story of the election of eighteen sixty-eight. There was no question about the Republican choice for president. Party leaders wanted General Ulysses Grant. Grant had been head of the Union army during the last part of the Civil War. Under his leadership, the Union had won. And now, he was the best-liked man in the country. Wherever Grant went, former soldiers waited to shake the hand of the man who had led them to victory against the Confederacy. The Democratic Party had a much more difficult time choosing a candidate for president in eighteen sixty-eight. Forty-seven men wanted the nomination. After several votes during its convention, the party failed to choose one above the others. Finally, party leaders looked for a compromise candidate. They chose Horatio Seymour, a former governor of New York state. He won the nomination on the twenty-second ballot. Seymour, at first, said he could not accept the honor. He said he did not want to be president. But finally, after much urging from other party leaders, he agreed to run against Grant. The presidential campaign was a strange one. 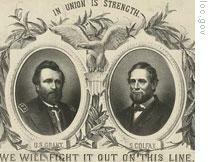 Neither Grant nor Seymour campaigned very hard. Grant told his advisers he would take no part in the election campaign. Seymour spent much of the time working on his farm. The real campaigning was done by party supporters. Republicans urged Union men to "vote as you shot" for Ulysses Grant -- the man who won the Civil War. They warned that Horatio Seymour and the Democrats were all secret rebels in their hearts. Seymour's supporters spent most of their time answering Republican charges. They struck back by accusing Grant of being a liar. They said he was controlled by extremists. They said he would rule from the White House like a dictator. The Democratic attacks failed. Grant got more popular votes and electoral votes than Seymour. He won the election. It was a great victory for the military hero. Yet it also was the start of an administration that would suffer many problems. 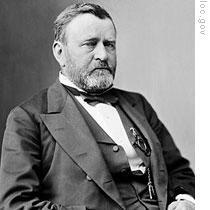 Ulysses Grant would prove to be much less successful in politics than in war. As Andrew Johnson prepared to leave the White House a few months after Grant's election, he would look back on some successes during his time as president. True, he had lost the political fight to control the re-building, or reconstruction, of the defeated southern states. But he had won the equally important fight to keep the presidency independent from Congress. Johnson also could look back on some successes in foreign relations. During his administration, he got Napoleon the third of France to withdraw French forces from Mexico. And he got more territory for the United States. In the spring of eighteen sixty-seven, the Russian minister in Washington made a surprise offer. He said his country was willing to sell some of its territory in North America. Secretary of State William Seward quickly prepared a treaty accepting the offer. Russia wanted ten million dollars for the land. Seward said the United States would pay only seven million dollars. Russia accepted, and the treaty was signed. The United States flag was raised over Alaska. Many Americans protested the purchase of Alaska. They thought seven million dollars was too much to pay for a worthless piece of frozen land. They said the deal was foolish. They called it "Seward's Folly." In time, of course, these critics were proved wrong. Alaska's wealth in oil, natural gas, trees, fish and animal skins makes its purchase one of the greatest deals any country ever made for territory. On March fourth, eighteen sixty-nine, Ulysses Grant traveled to Washington for his inauguration as the eighteenth president of the United States. Out-going president Andrew Johnson refused to take part in the ceremony. Before Grant arrived, Johnson left the White House. As he walked out, he told a friend, "I think I can already smell the fresh mountain air of my home in Tennessee." Americans had high hopes for their new president. They saw Grant as a strong and silent soldier -- a great leader who had won a long and bitter war. But there was another side to Grant which most people did not see. During the Civil War, the general had been a great hero. For many years before that, however, he had been considered a failure. As a young man, Grant entered West Point, the nation's school for army officers. He did poorly in his studies. He did not like responsibility. Somehow he completed his studies and became an army officer. He fought in America's war against Mexico. After the war, Grant got into trouble. He drank too much whiskey, too often. The army forced him to resign. For the next eight years, he tried one thing after another. He failed at each one. He tried farming, for example, and failed. He tried selling land, and failed at that, too. At last, Grant appealed to his father for a job in a store. He held this low-paying job until the Civil War started. Then he finally got back into the army. He got his chance to succeed. Still, the years of poverty and failure affected Ulysses Grant. They made him lack trust in his own judgment and abilities. This feeling showed itself when Grant reached the White House. The new president had little knowledge of politics or government. And he refused to ask for advice from experts. To do so, he felt, would show a lack of intelligence. For advice, he depended on close friends. These were the men with whom he had served during the Civil War. Grant had never been able to make much money. He liked and had great respect for men who had. He became friends with some of these wealthy men. He accepted gifts from them. This weakness for money and power became clear when he announced his choices for his cabinet. Grant named a rich businessman to be treasury secretary. The Senate rejected him. Grant named another rich businessman for Navy Secretary. This nomination was approved, even though the man had never been on a ship. Grant named several other rich people and old military friends to the cabinet. Many lacked political experience. Some critics attacked the appointments. One critic said: "Never was an administration begun with more hope and less ability." 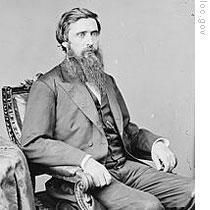 The best adviser Grant named was John Rawlins as Secretary of War. Rawlins was a good judge of men. And he was wiser than most of Grant's other friends. He alone, of all those around the president, would argue with Grant when he believed him to be wrong. Rawlins, however, was in poor health. His condition grew worse during the summer of eighteen sixty-nine. Early in autumn, he died. Rawlins' death hurt President Grant deeply. But the lack of honest, wise advice in the White House would hurt the country even more. That will be our story next week, in the next program of THE MAKING OF A NATION. Our program was written by David Jarmul and Frank Beardsley. The narrators were Larry West and Shep O'Neal. You can find transcripts, MP3s and podcasts of our programs, along with historical images, at www.unsv.com. And you can follow us at VOA Learning English on Twitter. Join us again next week for THE MAKING OF A NATION -- an American history series in VOA Special English. In my idea Grant is a great leader during the civil war ,but he wasn't suit for a present.